Commonly referred to as a part of the thin section series, these bearings can be found in anything from wheel hubs to crankcases and transmissions. 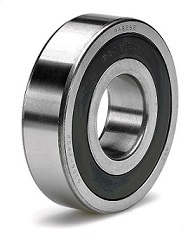 The Japanese bearings are made by industry leading manufactures such as: NTN, NSK, Nachi and Koyo. We are also a distributor for KBC, the leading producer of bearings from South Korea. If you don't see your size we have much all types please contact us.